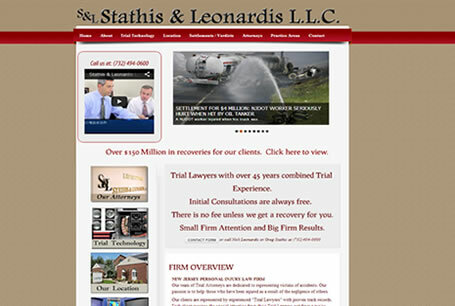 Sthatis & Leonardis is a prominent Law firm in Middlesex County. They came to Rytechsites, because they wanted their website to show case who they are and the cases that they have settled both in and out of the courtroom. For this site we have utilized embedding youtube videos, and complex photo galleries. We also implemented a 'popup' featured, so if you click on a specific case image you can see it in full detail. We also did some graphic design work to make different aspects of their firm 'pop', and be easy to navigate through the page.